Significant Sig Robert Friend ’53 entered Chapter Eternal on February 3 at the age of 88. Bob played 15 years with the Pittsburgh Pirates, making four All-Star appearances and fronting the rotation on the World Series-winning 1960 team that defeated the New York Yankees in seven games. Robert Friend was born in Lafayette, IN and grew up in West Lafayette. He was a baseball and football star at West Lafayette High School. Bob enrolled at Purdue in the fall of 1949, where like his father and several siblings had previously, he planned to play on the football team. A shoulder injury, however, made him choose between football and baseball, and he signed with the Pirates organization before the 1950 season. After just two years in the minors, he was promoted by Branch Rickey to join the Pirates’ starting rotation. 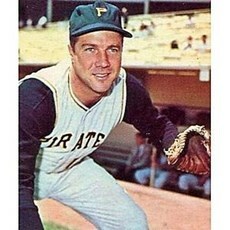 “Bob was truly one of the very best to ever wear the Pirates black and gold”, stated Pirates president Frank Coonelly. Bob was 20 years old when he made his major league debut with Pittsburgh in 1951. He had his first winning season in 1955, his fifth year with the Pirates. The Pirates finished in last place that season, but Bob went 14-9 and became the first pitcher to lead the N.L. in earned run average on a last place team when he posted a 2.83 mark. He also led the National League in starts (42) and was chosen for the National League’s All-Star team that year. Known as the “Warrior” for his amazing durability, Bob never missed a start in his 16 year baseball career. He led the league in innings pitched twice, totaling almost 600 innings through 1956 and 1957, and led the N.L. in games started each season from 1956 to 1958. He was an All-Star in 1956, 1958 and 1960. His best season came in 1958, when he had a 22-14 record with a 3.68 ERA, tying the Milwaukee Braves’ Warren Spahn for the league lead in wins. Bob finished third in the N.L. Cy Young Award voting and sixth in the MVP race that year. Bob pitched in 568 games over the span of 15 seasons with the Pirates. He won a career total of 197 games and still holds the Pirates franchise record for career innings pitched (3,481), games started (477) and strikeouts (1,682). 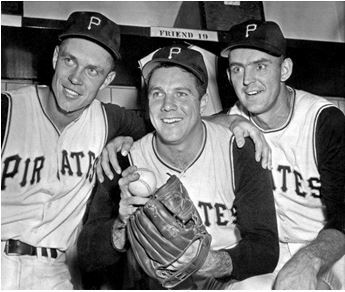 In 1960 Bob led the Pirates to the World Series Championship when he won 18 games, posted an ERA of 3.0, had 183 strikeouts, while leading the team in games started and innings pitched. 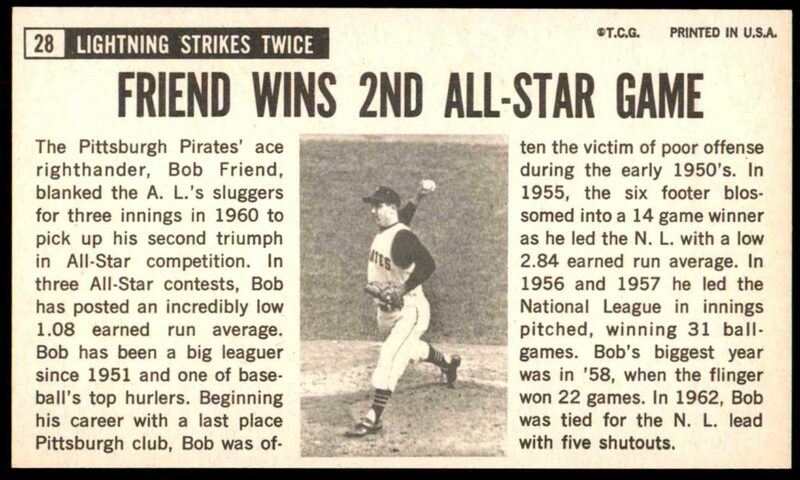 Bob was the Pirates opening day starter seven times. He won two All-Star Games, and he beat the New York Giants, 9-1, in their last game at the Polo Grounds on Sept. 29, 1957. Another famous first: On April 13, 1963, Bob gave up a leadoff triple in the eighth inning to a Cincinnati Reds rookie named Pete Rose — it was the future hit king’s first career hit. Bob became a Yankee before the 1966 season. He posted a 1-4 record before they sold him to the Mets in June. He went 5-8 for them to close out his career. Brother Friend went on to a successful career in the insurance business in the Pittsburgh area and served eight years as Allegheny County controller, from 1968 until 1976. He is survived by his Sweetheart of 61 years, Pat. The brothers living in the chapter house during the early and mid ‘50’s recalled that Bob took a few extra years to get his economics degree. He returned to Purdue for seven off seasons when he would attend classes during the fall semester before going back to spring training for the upcoming season. Bob’s Purdue background followed him to Pittsburgh where fans remember the local radio announcer yelling when Bob hit one of his rare doubles, “Friend steams into second like a Purdue Boilermaker”. Bob was a extremely unassuming Brother and a heck of a squash player. While watching the World Series game that Don Larsen pitched his no hitter, I can remember Bob explaining why he didn’t think Larsen would win. Needless to say he got a lot of kidding about that. All in all, he was the epitome of “a class act”, and true credit to Sigma Chi!